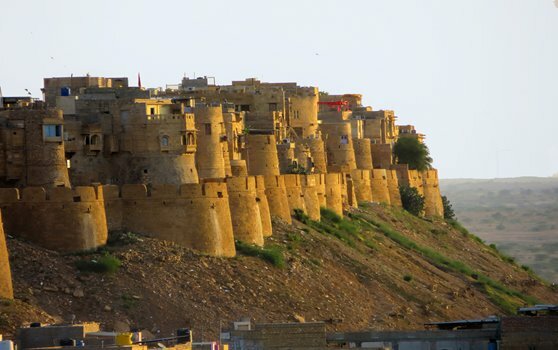 Your itinerary starts with the departure from Jaisalmer by jeep at 2:00 pm ( October to March ) or 3:00 pm ( April to September ) to the camp, a drive of 60 km. Starting from the camp, you can enjoy an afternoon camel ride to isolated sand dunes, visiting some Dhanis ( small villages ) on the way. While riding on your camel you can experience the beautiful sunset after which you will arrive at the dunes for chai/tea/coffee and can watch your tasty dinner being freshly prepared for you over the camp fire. After dinner, campfire and star watching we return to Jaisalmer by jeep.Your tour ends at 9:00 pm ( flexible, according to the group’s wishes ) . Each of the above prices includes transfer to and from the camp by jeep, own camel to ride, all food and mineral/filtered water.